Year FOUR is going strong! This quarter our groups touched the lives of individuals battling Parkinson’s disease; mothers experiencing a tragic life event; first responders and their families; and disadvantaged youth and teens. Each of these organizations are doing important work in our community. Thanks to our members’ giving hearts, we donated $28,500 this quarter and people’s lives are being impacted on a daily basis. To date, our chapter has donated $322,800 to local charities. Ahwatukee donated $11,300 to Banner Neuro Wellness, an organization under the umbrella of Banner Health Foundation. This organization provides complementary to current medical treatments and therapies for individuals and families who are affected by Parkinson’s disease and other neurological conditions. 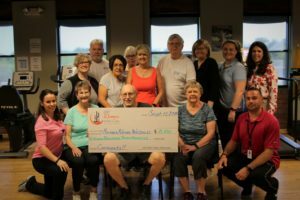 It costs $45 a month for individuals with Parkinson’s disease to use the program and facilities. Our donations will be used to provide scholarships to people who cannot afford this vital resource. 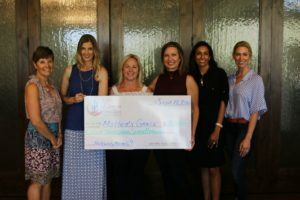 Mother’s Grace was the recipient of $8,800 in donations from our Scottsdale group. This charity is dedicated to the support of mothers and children who have endured life tragedies. By providing financial support and guidance, Mother’s Grace empowers these women to reach their goals of making a difference in their communities by helping others inflicted with similar circumstances. Mother’s Grace is committed to healing the world one mother at a time. Our donations will be used to help between 5 and 10 Valley families with their immediate needs such as rent, utilities, car repairs, groceries, medical payments, and other acute needs that are explained in Mother’s Grace. Our donation will be used for outreach and implementation of the program in our community. 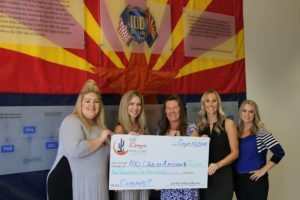 Our West Valley sister group donated $2,600 to 100 Club of Arizona. This charity’s mission is to provide financial assistance to families of first responders who are seriously injured or killed in the line of duty and provide resources to enhance their safety and welfare. They have proudly served the public safety community since 1968. Our donations will be used in the general fund for whatever the most pressing need is at the time, including financial assistance to families and safety stipends. 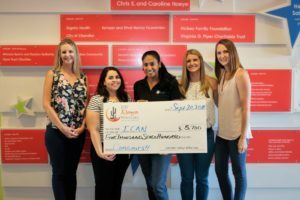 Our East Valley group selected ICAN Positive Program for Youth and donated $5,700. ICAN is a free youth center in the East Valley that offers programming for youth, teens, families and the community. ICAN’s nationally-recognized prevention programming teaches disadvantaged youth real-life skills including goal setting, positive decision making and how to avoid the risky behaviors that are prevalent in the community ICAN serves. Our donations will be used to support the youth after-school programs offered in Chandler. Specifically, funding support staff to provide the program, supplies needed to facilitate program activities, food and transportation costs associated with the program and a portion of program training and development to ensure the highest quality programs are provided to kids. 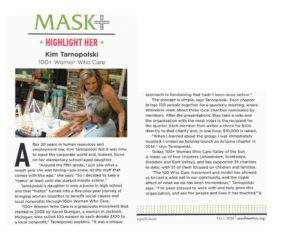 Congratulations to our very own Kim Tarnopolski for receiving the First Runner Up award in the MASK Moms Making a Difference series. Kim was recognized for her work with our chapter and the impact she is making on children throughout the Valley of the Sun. Way to go, Kim! Happy fall! See you in November!